Banks should try to mitigate their risks by working with, investing in, or monitoring potential fintech partners. Boston, September 21, 2017 – Fintech providers are often praised for their innovation and flexible business models, and few can deny that they force banks to expand their customer-facing tools and improve the usability of their offerings. But not all banks are ready to take on the risks associated with a partner that lacks a proven track record and in-depth knowledge of banking. Can banks lower their risk when partnering with fintech firms? And what can traditional vendors do to fight back? 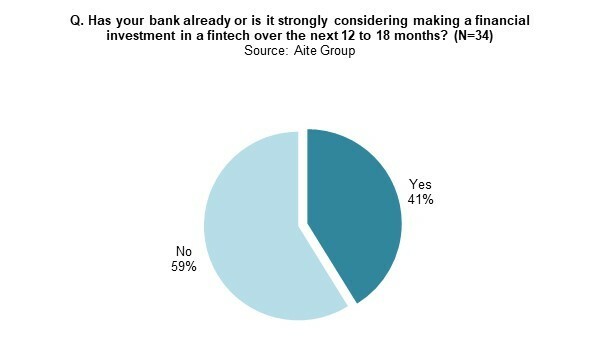 Based primarily on 34 detailed phone interviews Aite Group conducted with bank executives at large and midsize banks around the globe in June and July 2017, this report explores the growing presence of fintech companies in the cash management industry and banks’ attitudes toward them as well as the areas in which these vendors are most likely to be leveraged. This 14-page Impact Note contains six figures and three tables. Clients of Aite Group’s Wholesale Banking & Payments service can download this report, the corresponding charts, and the Executive Impact Deck. This report mentions Bill.com, EyeVerify, MineralTree, Mirador, OnDeck, Ripple, Tradeshift, and Viewpost.